Spend your next dream vacation in 30A at 5 O’Clock Somewhere! Drive up and you’ll be greeted by a cozy white picket fence and your sea foam home. On approach you’ll be excited to see spacious balconies on every floor to the third. Your Florida palms and other trees by the sea offer desired privacy but they won’t obscure your view. Parking for two vehicles and plenty of access to your vacation home will ensure your dream summer vacation happens with minimal luggage trips! 5 O’Clock Somewhere offers five bedrooms and three floors with the master bedroom on the top floor with its own private balcony. As you enter the home you’ll see one of the two living rooms which exit into the first and second bedrooms. These bedrooms feature queen beds and en-suite full bathrooms. The third bedroom sports two queen/twin bunk beds and an adjacent full bathroom. The second floor opens up into the main living room, the dining room, and kitchen. Stainless steel appliances and beautiful granite counter tops adorn the kitchen. The dining room seats eight and the breakfast bar seats three. The third floor features the master bedroom with a king bed, and large en-suite master bathroom. This stunning home in Seagrove beach is conveniently located in community of Summer’s Edge. 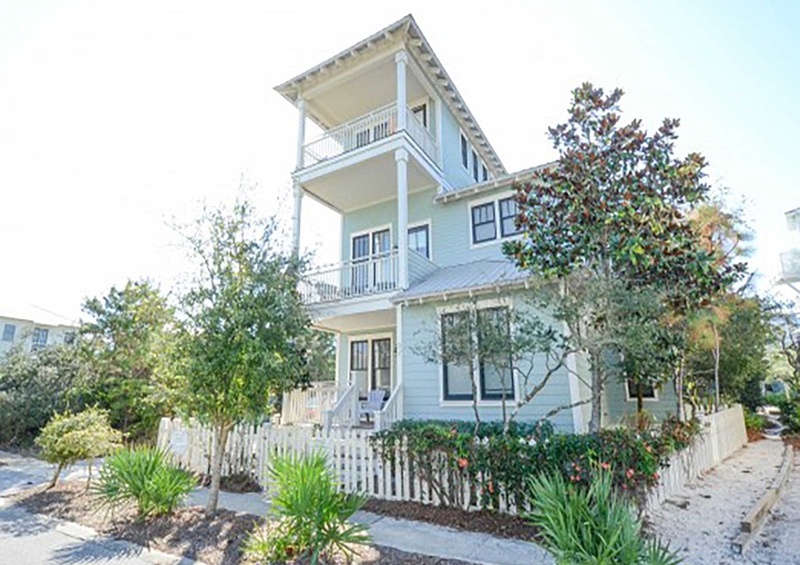 Located less than two miles from the town of Seaside, you’ll be perfectly positioned in the heart of 30A and less than 100 yards to the beach. Make your reservation now, and also be sure to check out local events to make this the vacation to remember!